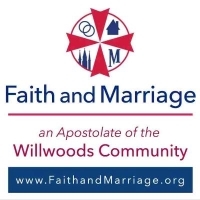 The Faith and Marriage Apostolate of the Willwoods Community is dedicated to promoting the Sacramentality of marriage and providing married couples opportunities of growth, enrichment, and support. The Willwoods Community is a Catholic Non-Profit established in 1978 by a group of married couples desiring to support the Catholic Church and the community through prayer and service. Since then, Willwoods Community has grown to serve in different areas, including Faith and Marriage, Affordable Housing, WLAE TV and TheDailyMass.com.